From Kokopo and Rabaul we headed South to Budibudi (known on the chart as the Lachlan Islands) where the trading began in earnest. Our three boats were surrounded by canoes from dawn til dusk, plying a few vegetables, coconuts, fresh crayfish, some carvings or the famous bagie (more of them in a minute). In exchange, we gave rice, sugar, noodles, clothing, fish line and hooks. The fresh produce was not plentiful, as these islands are mainly sand, with little good soil. The locals have to sail by canoe to the Woodlark Islands to grow vegetables, often being away for 6 months at a time. Scott picked up some carved paddles, which were in use until we traded for them! And the bagie. Bagie is the shell money traditionally and currently used in PNG. It is formed from shells gathered from the reef and then shaped by hand into small coral-coloured discs that are threaded onto rope along with decorative shells and seeds. Bagie are still used for purchasing brides, livestock (yes, I did find it hard to write that, but that's the way it is) and other items between the islands. Each length of bagie has a specific value. I traded for dozens of them, most of which I modified into long necklaces, but a couple of which we kept in their traditional form. Seth has a very cool bagie of his own, after a man came to trade and accidentally dropped his necklace into the water. Seth dived and found it and the man insisted on giving it to him – so kind, as the bagie are a very valuable item. In Budibudi we were visited by the two chiefs, brothers Tau and William. The usual giving of gifts took place – as we went South the chiefs' expectations about how many gifts they should receive appeared to increase! We would present pretty bowls, cloths, soap & sugar for their wives and rope, fishing tackle and t-shirts for the chiefs. We took supplies into the school, including the requested medical kit to treat the children's tropical ulcers and skin infections. This didn't stop Chief William sending out a long shopping list of items just before we left – we politely declined. Then it was the Louisiades, starting with Bagaman. More trading, more canoes; a constant stream of requests and negotiations. We picked up some lovely ebony carvings and of course the Bagie Queen was in her element. I should mention that, for those of you that don't know, the Louisiades are frequently visited by cruising yachts, especially since the Louisiade Rally from Cairns began four years ago. This rally is a great idea, with a group of yachts spending 6 weeks in the archipelago delivering useful items to these remote islands – water tanks, medical supplies, clothing, toys etc. The rally participants are willing to pay cash for the carvings and baskets and freely give many items of value. This is lovely of them and much appreciated, but we found that this made the experience of the Louisiades quite different to the other island groups. The local people were more inclined to come out to the boat just to ask for things – something we hadn't experienced much elsewhere – and to be quite focussed on cash, though this is of limited use to them. Nevertheless, the region is beautiful and we loved it. From Bagaman we had a blissfully quiet week or so in anchorages too far away from a village to allow so many canoes to come by. We visited some villages to deliver gifts and show respect to the families whose waters we were staying in. If we'd caught any fish, we offered these too and these were happily whisked away. Some of these communities were desperately isolated and did not even have the means to collect water. They were reliant on the lagoon for fish and their gardens for taro, cassava and coconuts – any other items came to them by luck or chance. Health issues are not attended to; there are no medical services, women die in childbirth and children can easily become undernourished. We handed out sea-ulcer treatment – packs of antiseptic, alcohol wipes and clean bandages – but it is very little. Children learn to live on coconuts from infancy. As the need became more evident, the boat became lighter and lighter – we went through every cupboard for things that we could do without – clothes, plastic containers, sheets, towels, hats, ropes, tarps, buckets. We ended our Louisiade exploration in the Duchateau Islands, where we saw not a soul. 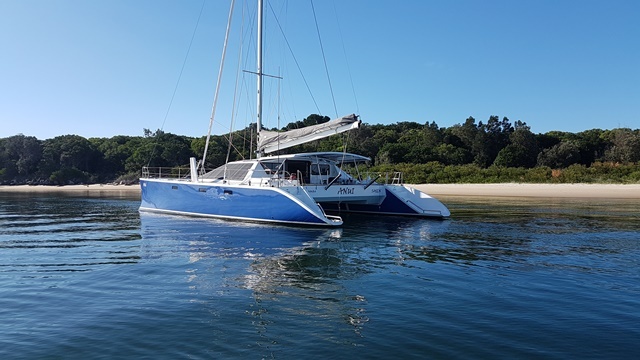 We had a solid week's work on the boat to get ready for our return to Australia – our quarantine requirements are the most stringent in the world. We emptied and cleaned every drawer, cupboard and locker. We gave away all of our food that would be refused entry. Our only worry was that Gary would make an appearance, but luckily he stayed quiet and all was well. So on 31 October we left PNG, reluctantly. As soon as we left the lagoon we were sailing and had a very speedy and wild ride home – 500 nautical miles in 50 hours! And now we are taking stock in Cairns prior to beginning our trip South. It feels very strange to be away from our beautiful islands and back in a busy town surrounded by pale people. Nobody hangs out of buses and cars to wave at us here – we are once again anonymous. It will take some getting used to. Remember Ninigo? Our favourite of all island groups at the top of PNG. Well, I am working on some ideas as to how to benefit that community from Australia and am talking to the Education Department over there – I may be asking for some contributions from my friends, so watch this space. Education for their children is the best chance PNG has of going into the future – and books are the way there.... Don't throw your kids' story and reference books away – I may be asking for them! A couple more days in Cairns and, weather permitting, we'll be heading South. Our blog entries will be less exciting from now on, but will keep them coming. Let us know if we're boring you! Wow Sarah what a lovely read, back in Cairns boohoo but what a ride. Always thinking of you guys. lol Sounds like a fabulous time all round! With slightly more people around than your average village, you might like being anonymous. You can now race the whales back south!